EagleVail’s Mikaela Shiffrin quickly bounced back from a rare second-place finish in her last race in Flachau, Austria, last week with a sizzling giant slalom victory on the brutal Erta course in Kronplatz, Italy, on Tuesday. 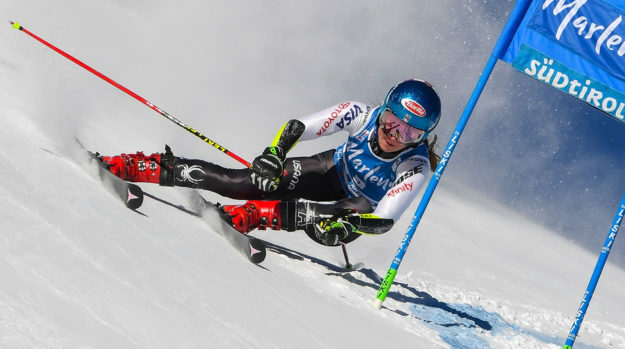 It was Shiffrin’s remarkable 10th victory of the season. Shiffrin beat out France’s Tessa Worley by a whopping 1.21 seconds to pick up the 53rd victory of her career – just two behind tying Vreni Schneider for third on the all-time women’s list. Shiffrin is also now just four wins from tying Schneider for the most wins in a season (14). A rested, re-charged and pasta-fueled Mikaela Shiffrin (Avon, Colo.) finally mastered the one giant slalom course that has given her fits the past two years to pick up FIS Ski World Cup victory number 53 in Kronplatz, Italy, Tuesday. Starting bib 5, Shiffrin came out fired up in the first run, building a 1.39-second lead over Tessa Worley of France, and 1.42 seconds over Slovakia’s Petra Vlhova. Worley posted the fastest second-run time to move into the lead ahead of Italy’s Marta Bassino, leaving Shiffrin as the final racer on course. With her victory, Shiffrin leads Vlhova by 496 points in the overall World Cup standings, and she moved atop the giant slalom standings as well, 10 points ahead of Worley. Shiffrin also leads the slalom and super-G World Cup standings. Nina O’Brien (Denver, Colo.), who scored her first World Cup points earlier this season in slalom at Killington, Vermont, returned to the World Cup in Kronplatz and picked up her first World Cup giant slalom points, and finished 26th. Up next, the women’s World Cup moves on to Cortina d’Ampezzo, Italy, Friday with a rescheduled downhill from last week’s canceled race in St. Anton, Austria. Lindsey Vonn (Vail, Colo.) is scheduled to make her return to World Cup action Friday. Downhill racing will also take place Saturday in Cortina, followed by super-G Sunday. Shiffrin has indicated she will not start either of the two downhills, but as the World Cup super-G leader, she may be in the start house for Sunday’s super-G.